TRINOVA BIOCHEM is the European distributor of MOLTOX® (USA), offering test systems for genetic toxicology, e.g. Ames mutagenicity test (OECD 471). NEW: Bacteriological cell culture media, agar plates, reagents and buffer in MOLTOX® quality for INDUSTRIAL, ENVIROMENTAL and MOLECULAR microbiology. Assay kits for evaluation of proliferation, potency and toxicity of stem and progenitor cells by Preferred Cell Systems™ (USA). TRINOVA BIOCHEM is the European distributor. Cytogenetics and cell therapy media of FUJIFILM Irvine Scientific® for Germany, Austria & Switzerland. 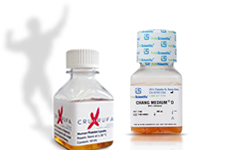 The cell culture portfolio includes e.g. CRUX RUFA Human Platelet Lysate as xeno-free alternative to FBS. TRINOVA BIOCHEM GmbH was founded in 1999 by Arthur Ronzheimer. TRINOVA represents and distributes biomedical assays, reagents and media. Meet us at the VAAM Microbiology Conference in Mainz! LB Agar Plates - Ready to use! Rainbow Trout Liver S9 - available now!